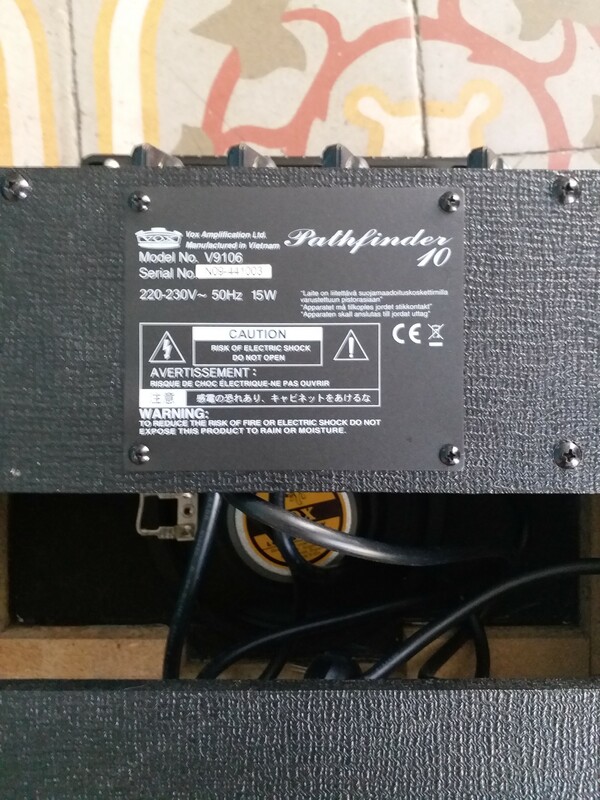 Pathfinder 10 , Solid-State Combo Guitar Amp from Vox in the Pathfinder series. 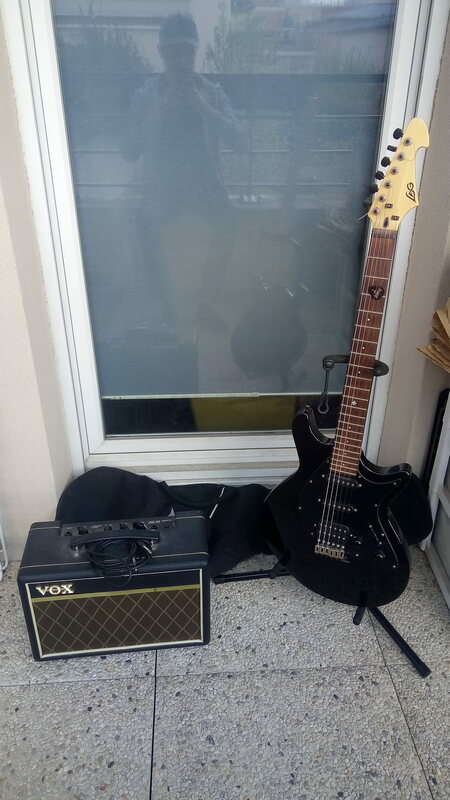 YuriW's review"Great for practicing and small gigs"
This little Vox is a transistor amp with 15W (according to the label at the back of the amp, but some people say it's 10W...), one input, and one 6.5' speaker. The nice looking chicken head knobs are gain, treble, bass and volume, plus the overdrive button and a line/headphones out. No reverb, no fx, no fx loop, no footswitch... a very simple amp, straight to the point. Plug and play, man. Bought it used, so I've never even seen the manual. I like chicken head knobs, they are easy to grab and it's easy to see where they're pointing to. This amp is a little bigger and a little heavier than other ones with the same power, but not a big deal. Looks and finishing are pretty good too. 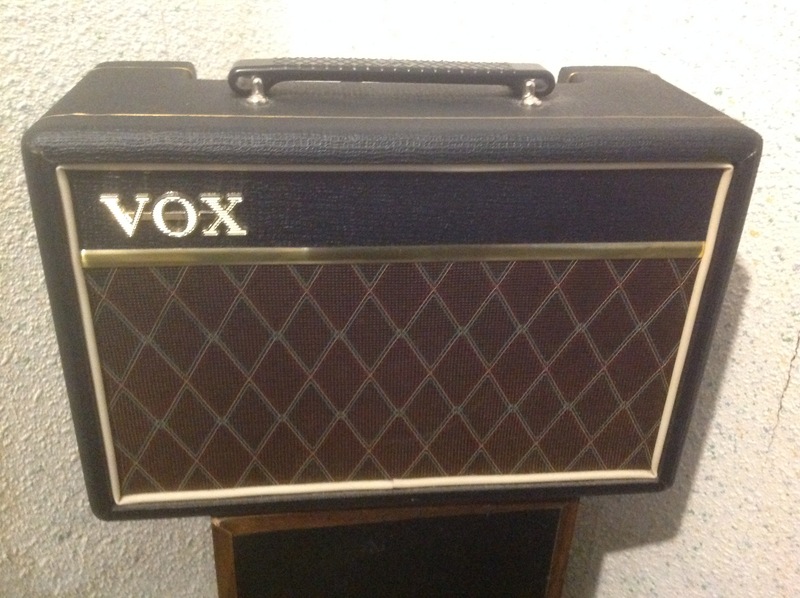 Talking about rock here: it actually sounds like a Vox amp, which is a good thing. The clean tone is nice and full, the drive can go from a little crunch to heavy enough for Black Sabbath, and you can use the guitar volume knob to bring the dirt down a little when you want to. Few knobs, few options, but you either don't need any tweaking to get good sounds, or don't get them at all. It is loud enough to play with a drummer if the drummer is not insane, and, as many other guitar amps, it sounds better whith the volume knob between 60%, 65% and... I would say 75% at most. More than that and 1) sound gets worse - dirtier, but not in a good way) 2) It doesn't really get any louder. Talking about other styles here: tone wise, you can play many different things with this guy. I would say that you canNOT get tones like those really bright-roland-jazz-chorus stuff and the really heavy-mesa-boogie stuff (at least not without a drive pedal). Comparing this one to other small amps in the same price range I personally like it better for rock n' roll, it crunches nicer than the little fender champs but the clean tones are better than the marshalls. Its sound is not going to blow your mind, but for an amplifier this small and this cheap, it's certainly really good. Not having a mid frequency knob is a bad point. This amp likes my guitars and works fine with them, but I can see that situation happening where you want a certain tone and can't find it... and, well, you never will with only treble and bass, sorry. So in the end what I say is: if you like rock n' roll and need a small amp to study and to play small gigs, plug your guitar straight into one of these and play it for 5 minutes. If you don't like the sound, no tweaking will fix it. But if you like it, look no further. 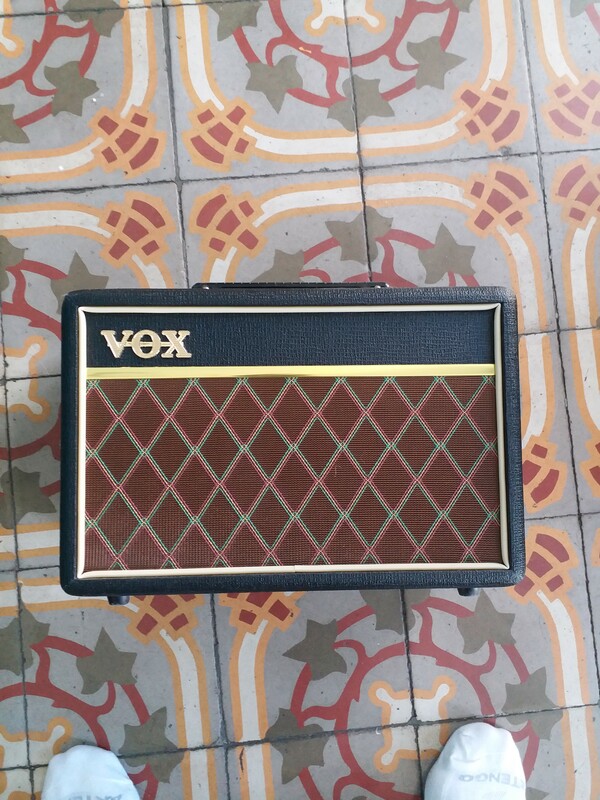 kyleohare's review"GREAT Bedroom Practice Amp"
Solid State, 10 watt amp. Simple controls with a drive channel. Plug your axe in and play! EASILY get great clean VOX tones out of this puppy. I mean, we're talking -- this thing really impressed me with how much it sounded like it had tubes in it. Vox really made a great practice amp worth mentioning! Sounds FANTASTIC on the clean channel. However, the 'drive' channel or distortion channel sounds rather tinny probably due to the smaller speaker size. It's still OK though, and very useable. 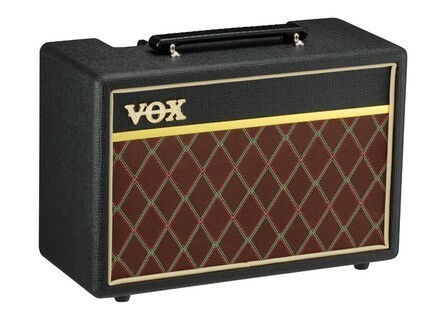 Love its size, weight, response and tube-like VOX cleans. Tried numerous practice amps before buying one of these, and my blues - playing father stole it from me promptly once I upgraded to all tube stuff. I have guitar gear OCD, so that's just how it goes. It was a clear sound that can become very round, it can mess it (for example with the master base and gradually returning gain). Saturation is really interesting, as long as we do not put background. but again, there was way to have fun. I am surprised by the performance of the small HP. It seems that FEIST used on stage for a sound a little dglingu has not m'tonne. Very happy with my choice. Unbeatable price-quality ratio. Not be enough in rehearsal with a rock band, but can fill bcp services. 100% happy with this choice. I t advisable by an old old fan "historic" Ramones that he too used to play on the record its protgs. One note: Cheap because Made In Vietnam, o how to move in the opposite direction of what one defends. jeangusyoung's review (This content has been automatically translated from French)" Hmm ..... not bad ....."
* What kind of amplification (lamp, transistor, ...)? * What is the power delivered? * The configuration is it simple? * Gets it easy to sound good? I did not watch much, but what I find a little strange is that there tu user. * Is it your style of music? * With what (s) guitar (s) / low (s) or effect (s) do you play? * What kind of sound you get and with what settings ("crystalline", "bold", ....)? + Small so portable, and not too gasworks. - ... And in fact, a true jack footswitch would have been welcome. y'avait widely instead. - To finish quibble, 20 W would also have been welcome. In the end, as I like the look and it sounds nicely after all I care. If I was not so attached to objects, a 20 W ORANGE CRUSHPIX would have already replaced. But he also has no possibility footswitch.